There can be few people, who during childhood, did not dream that their toys came to life, if you were unlucky you had terrors akin to a Poltergeist experience, though most would have found their toys to be benign, hopefully. 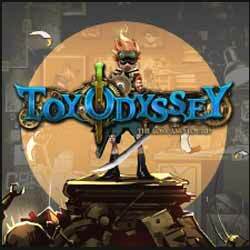 Toy Odyssey: The Lost and The Found, on the PS4 is from developer, Hikergames, a Vietnamese independent company. The game places you in the position of a toy that comes alive at night to battle the evil in the house. 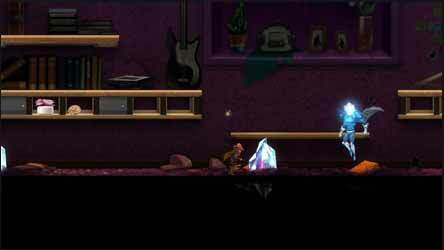 You play Brand, an action figure in a Metroidvania style action-platformer who sets out to save his owner, Felix. Each room in the house contains a new challenge, but the greater challenge for Brand is to discover the secret which hides within the house. For the inspiration for the game Hikergames have gone back to the platformers of the '80s, but have done so with charming modern graphics. For the most part this works well, occasionally it can be difficult to work out which places can be accessed as all the background is flat 2D so it’s often a case that you must guess which of the platforms are accessible from your current position. 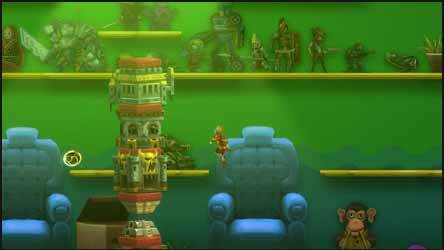 Get past that little irritant and you’ll find a game with a lot of replay value as each room is procedurally generated, which means that, within the limitations of the underlying programming and objects, there is an enormous number of potential rooms. The variation continues with the three hundred diverse types of enemies you are likely to encounter, as well as several end level bosses. Each of these is made up of toys which have been taken over and can be anything from other humanoid enemies all the way through to trucks and aliens. Each generated room presents you with different simple quests, collectables and weapons which can be upgraded via the game's crafting system. 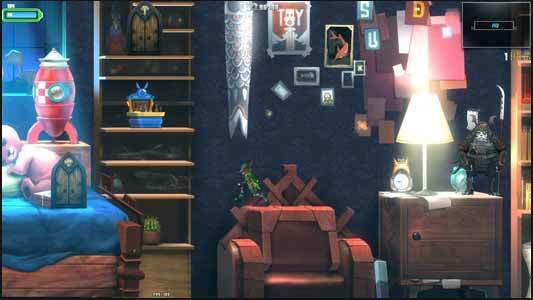 You begin the game in Felix’s room which acts as the game's hub and it is here that you can craft additional items and build up your character’s abilities. Quests are gained from in-game characters. If you want the story, the game provides you with over 30,000 lines of spoken dialogue. The vocal acting is good for an independent game and if you’re not interested, the dialogue is skippable. The overall game is solid and highly customisable. The enemies become harder the further you get into the house. Die and you start back in Felix’s room. If you're unlucky you may find that this has been raided and some of your stuff is missing, so it’s not worth keeping hold of objects which can be used to either craft or upgrade.